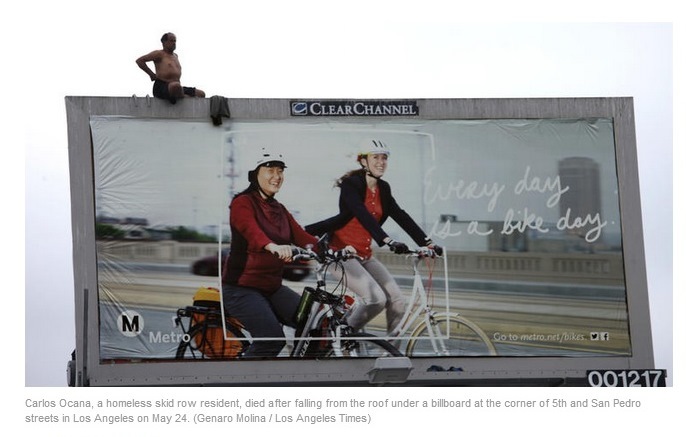 According to the Los Angeles Times, the Los Angeles Police Department and City of Los Angeles are “crafting new plan to help homeless on skid row.” This includes “developing a new strategy for taming pervasive homelessness on skid row, easing up on arrests for petty offenses while concentrating mental health, medical, housing and sanitation services in the long-troubled swath of downtown.” Unfortunately, this rhetoric – both on the part of the writer and city officials who are quoted throughout the piece – does not reflect the actual criminalization of an entire community and too often deadly use of force that continues to characterize LAPD policing in Skid Row. To be clear, LA CAN has opposed “broken windows” policing from the day it was introduced in the form of the “Safer Cities Initiative.” The flawed policing method, introduced by former Chief Bill Bratton in 2006, has brought nothing but long-term devastation that continues to plague the community. We would welcome any sincere efforts to shift the focus in Skid Row from policing and criminalization to housing, mental health services, and public health infrastructure. These are concrete solutions to ending homelessness that LA CAN has worked on securing for well over a decade. 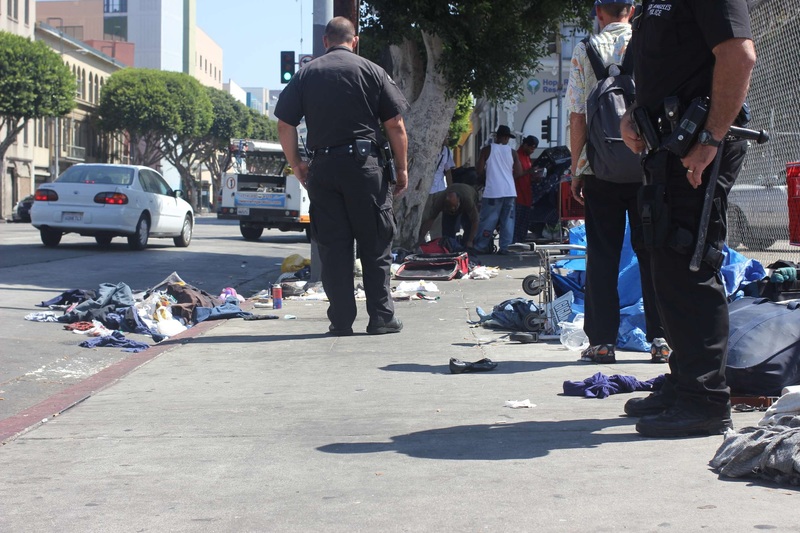 However, the residents of Skid Row just aren’t seeing this supposed “more progressive approach” that LAPD Captain John McMahon describes in the article. Rather, residents continue to experience the more of the same: Citations and harassment for basic life-sustaining activities (like sitting or sleeping on the street); a lack of restroom facilities, trash cans, public space and other public services/amenities enjoyed by Downtowners who live west of Main St.; the business community actively opposing projects that would house homeless residents; regular examples of aggressive, violent, and deadly force; Private property theft on the part of Business Improvement District Guards/Workers; Racial profiling and targeting; and, an overall policing style that violates basic civil and human rights and punishes people for being homeless rather than connecting individuals with the services and support they need. And if there is a new approach to how the community is policed, why haven’t the residents themselves heard about it? LA CAN has tried regularly to set up community meetings in which residents can express their ideas and concerns about the Safer Cities Initiative directly to LAPD and the Police Commission, and those demands and requests have been consistently declined. Recently LA CAN met with new leadership at LAPDs Central Division, secured a community meeting time and date to discuss Safer Cities implementation, only to have the meeting canceled at the last moment. LA CAN welcome’s a genuine move toward actual solutions to homelessness (housing, services, ending the Safer Cities Initiative) – and have been organizing to make that a reality. However, we fully understand that just because LAPD says something doesn’t make it so – we will be convinced when the rubber meets the proverbial road. June 2014 – A female resident of Skid Row being arrested after not listening to LAPD’s orders to get out of the street. Yesterday morning in front of LAPD Headquarters the Los Angeles Community Action Network announced our lawsuit against the City of Los Angeles, LAPD, and the Central City East Association because of their coordinated efforts to silence LA CAN, prevent us from exercising our first amendment rights, and their malicious acts that resulted in the wrongful prosecution of one of LA CAN’s longest term organizers, Deborah Burton. Click HERE (or on the photo to the left) to read the Los Angeles Times article covering the announcement. 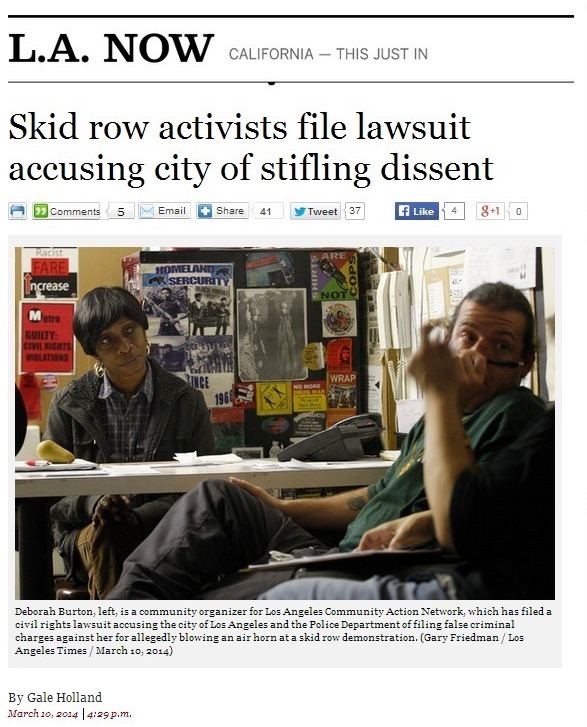 This lawsuit is a result of years of unfair and unjust targeting of LA CAN staff and members by LAPD, a long history of retaliation against us for fiercely and loudly opposing LAPD’s racist Safer Cities Initiative in Skid Row, and, more recently, their efforts to even more blatantly favor the Downtown business community’s position by stifling our right to protest and manufacturing charges against our staff.Through all of the attempts to criminalize us and silence us, LA CAN leaders and members remain unified and strong. We will continue to organize, continue to protest when needed, and we are hopeful the federal courts will uphold our constitutional rights and direct the City and LAPD to change their tactics, since all efforts at engaging with City officials to stop the years of harassment have failed. 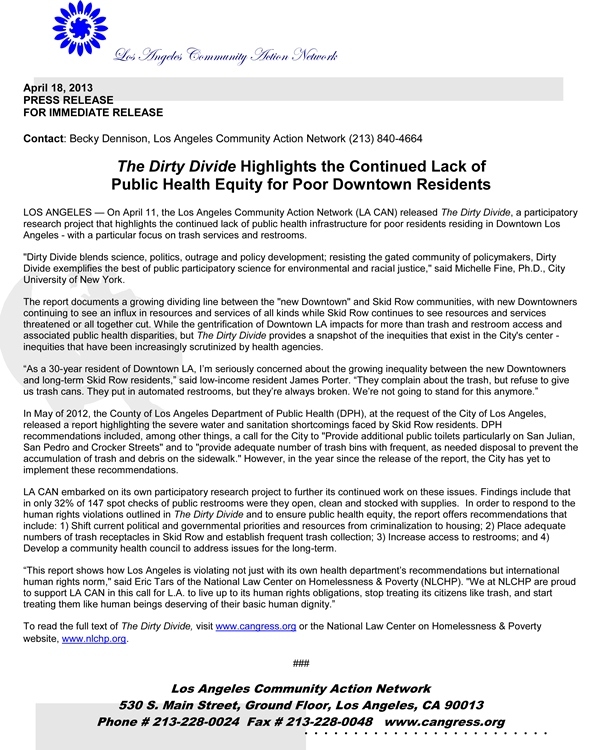 Click HERE to read the official LA CAN Press Conference Statement in its entirety. Click HERE to view the press packet, which includes the Press Release and a copy of the lawsuit, as well as a few key photos and emails from LAPD Officer Shannon Paulson to employees of the Central City East Association. These documents only scratch the surface of the coordinated effort to prevent LA CAN from exercising our constitutional rights.